The Butterfly Garden and Insectarium celebrates the world of bugs with 13 gallery rooms containing more than 70 live animal enclosures, 30 mounted specimen cases and a multisensory immersive theater experience. There are about 100 live arthropod species throughout as well as a variety of fish. 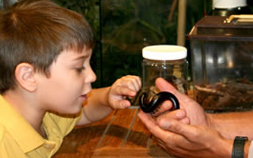 Visitors can experience live insect encounters, discover cultural aspects of insects, sample exotic insect cuisine, shrink in size to see the world from a bug’s perspective, and enjoy the tranquility of a Japanese garden while watching hundreds of butterflies flit about. This one-of-a-kind interactive experience is another “living classroom” designed to show how human lives are affected by nature—and what we all stand to lose without careful stewardship of its every, treasured resource.